By Costa Maragos Posted: May 27, 2016 6:00 a.m.
(l-r) Ben McVicar and Micheal Tymiak with this apparatus that will make a big difference for those who install and repair hydraulic hoses, saving time and injuries. Photo: External Relations. The best ideas sometimes come from friends and family. Just ask Engineering students Ben McVicar and Micheal Tymiak. Tymiak’s father, who owns a machine shop in rural Saskatchewan, asked for a gadget to allow workers to install hydraulic hose fittings. Click here as student Micheal Tymiak shows us how this simply designed gadget can lead to fewer injuries for machine shop workers. The fittings are usually twisted onto hoses by hand. However, such a repetitive work function can potentially lead to the straining of wrists and other hand-related injuries. “Micheal’s dad let us know about the straining of the wrists from doing such tasks,” says McVicar. 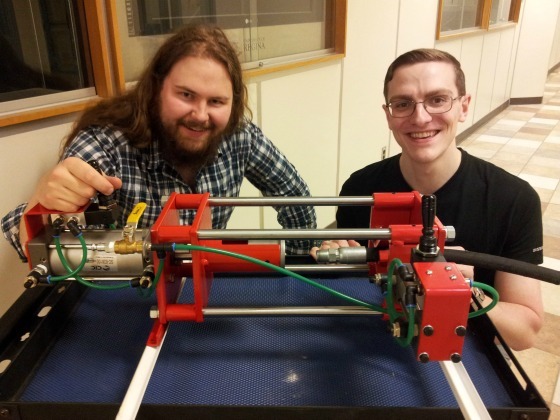 McVicar and Tymiak have come up with an affordable solution, and it was on display at Project Day recently, an annual showcase of the final design projects of fourth year Engineering students. The annual event is hosted by the Faculty of Engineering and Applied Science. The apparatus for installation of hydraulic hose fittings requires a worker to loosely attach the fitting to a hose. The machine takes over from there. “Alignment was a key issue until we realized we could initiate that alignment manually which really sped up our process. From there we found a way to hold that hose in place,” says McVicar. McVicar and Tymiak tested out the machine at a Regina shop. “They were amazed at how quick and simple this thing is to operate. They were happy with the results. Doesn’t matter what type of hose size you’re working with, or what type of hose head. It was able to get the job done in virtually the same amount of time every time, within about 15 seconds or so,” says Tymiak. Adding to the convenience, the gadget features standard parts taken off the shelf. “So if anything breaks or if someone else wants to make this, it is something achievable,” says McVicar. The students say this gadget might have some market value but for now they’re pleased their project turned out to be practical and achievable and it all started with an idea from family.